And so... we have come full circle. 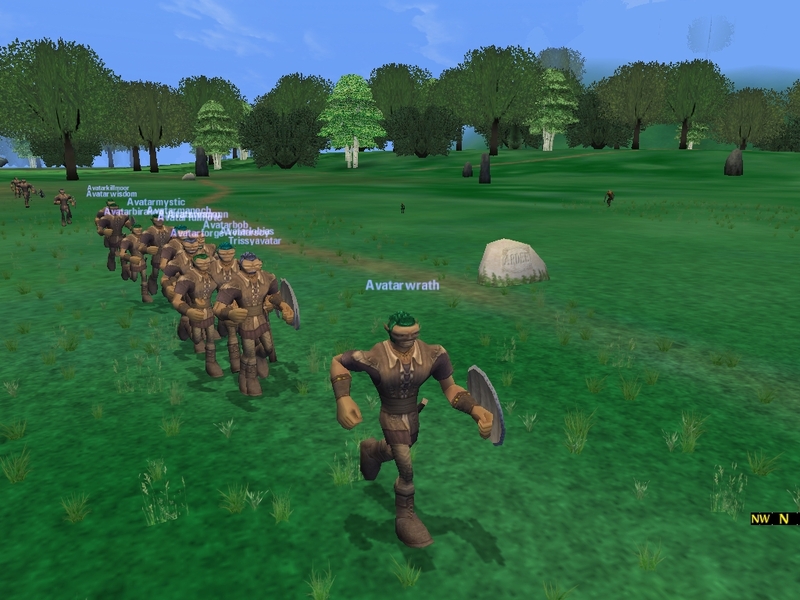 We are once again playing DAOC! We are playing in Hib for the time being. I look forward to seeing old names and rekindling old friendships and creating new ones! Cheers!!! We moved to wow. 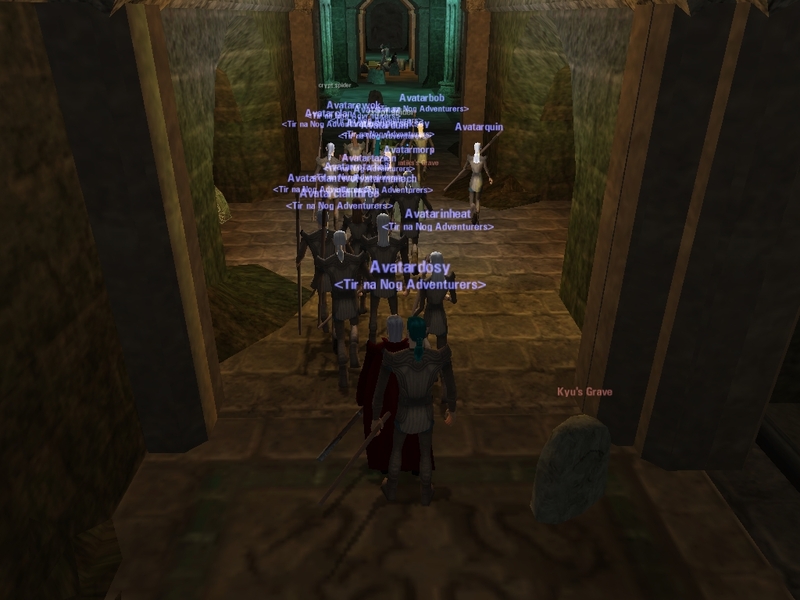 We enjoyed our stay in the wonderful world of DAOC - but alas, the action died down. 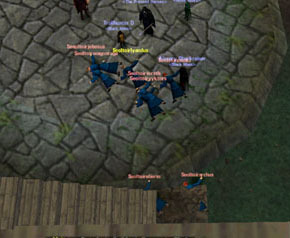 We spent far more time looking for fights than actually being in them. We enjoyed our stay, and had a blast. Thanks for all the good memories! I returned to the original look of the website that served us for 3 years. Although we had many revamps for memory's sake - I am keeping this one. _AAA brought home the final relic from Mid! Gratz to hibs on 20% power bonus!! Also, Gratz to AA for getting 2+ mil rps in a week! Great job guys! _Brash Bravado will be hosting a Tough Hib contest for the alliance. If you have any questions, be sure to get in touch with Wrath or Kirath. _Cluricaun Dance party hosted by Mutiny! Great time! We all had a LOT of fun, and its always nice to break the norm of the game! _Bog Troopers has joined the alliance! 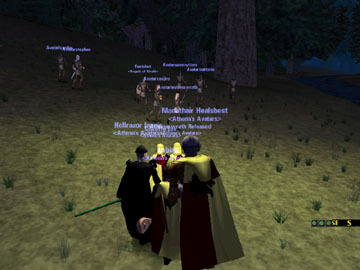 AA Forums a New Alliance, AAA! 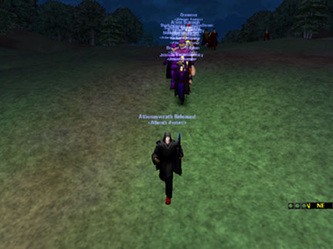 _Arcanum, Brash Bravado, The Black Company, Mutiny, AA, and Dark Redemption formed an alliance! 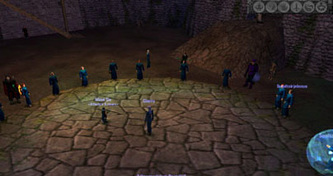 _Last guild meeting in 2003! Have a happy holiday guys, and I'll see you guys soon. I will be out of town during the week of new years. I will be in AZ for a week, so take care and be safe! From now on, every guild meeting there will be a new award. The Avatar of the Week Award. 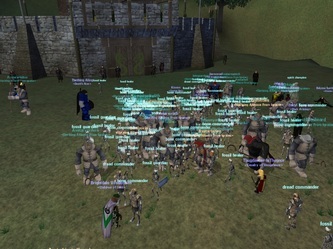 Gratz to Quinasia for winning this week... 150k Rps in 2 weeks, Way to go! Not only has she excelled in RVR, but she is a great role model for others to follow in her good attitude, great spirit, and willingness to help at any point in time. Way to go Quinasia! Guild vaults have also changed. See the member forums to check and see how it works now. 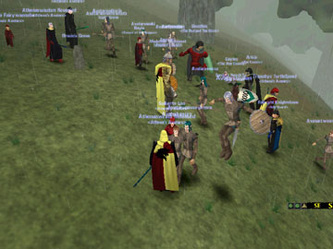 Special gratz to Twiddledee, Twiddledum, Morpurgo, Gimo, and Caerva for reaching level 50! Way to go guys! 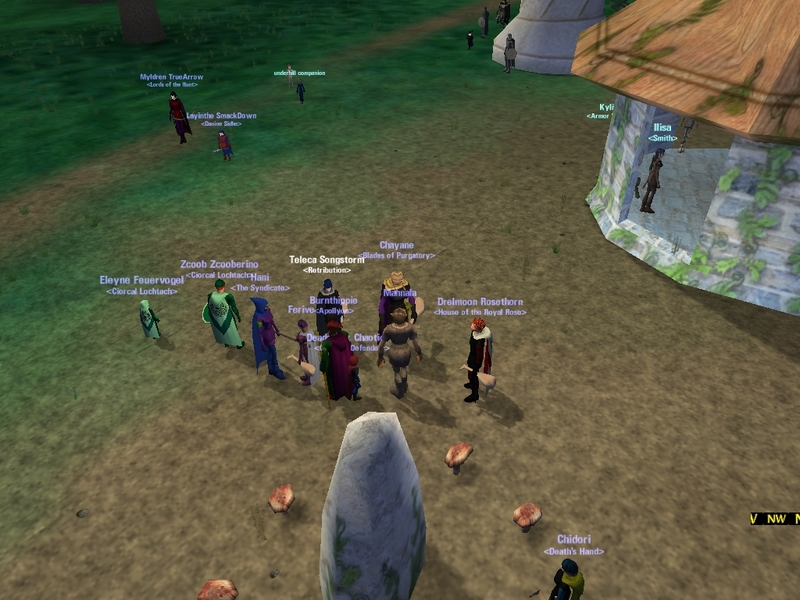 We had a GREAT guild event! Nekky Elf Muire Run! 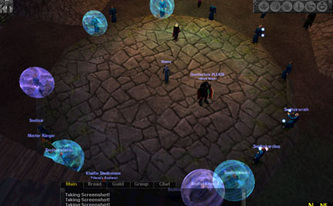 Gratz to Dosabus for winning first place with 500g, and Wiccet for winning second place, 100g! _1.64D, bah. /hood, keeps with messed up doors... and Focus shield gets nerfed. /rude mythic. !! _Relic Raid - We took all 3 relics from mid. 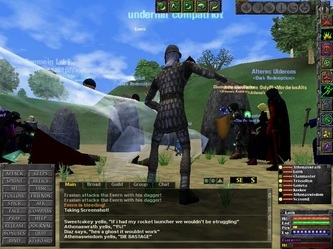 Hibernia is the first realm on Igraine Server to have all six relics. Good job - We kept them for three days! (Mid took a str relic three days later). Gratz to AA for 1 million rps earned in ONE week! Way to go guys! _Recently we purchased a house! We raised 60p in just three days with farming/donations! Very impressive! The guild decided a Villa would best suit our needs - and a Villa we bought! We are located in Kilkullen, lot # 3738. As promised guildies, your very own AA trailer house background. Click here for it! 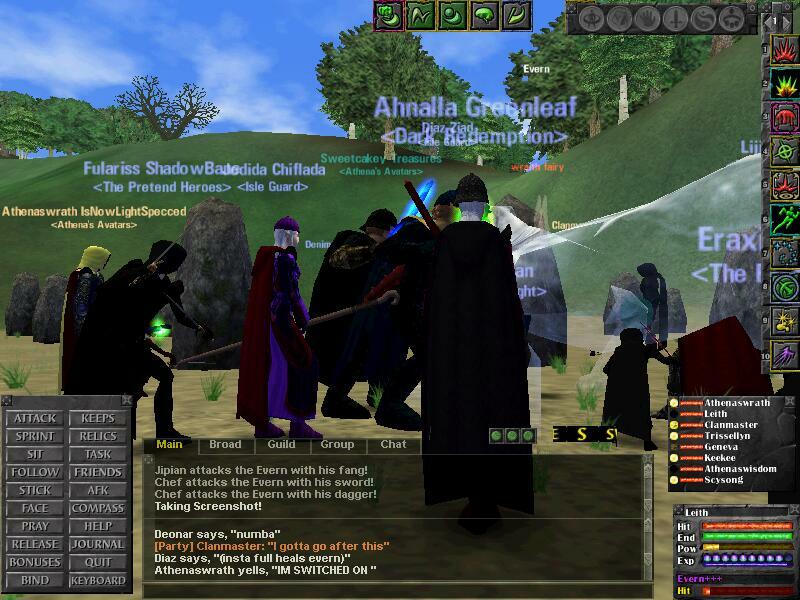 _AA hosted an alliance event. Everyone rolled level 1 bone dancers on Mid Bedevere. 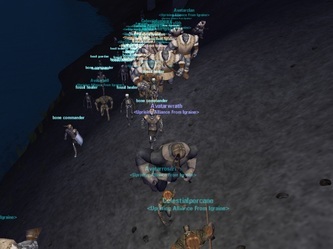 We all /leveled to 30, went to emain, and actually helped defeat the alb / hib zerg! WOOOOT! _We packed our trailer houses and MOVED on over to Alb Isuelt! We had a great time! Thanks for the support guys! _As the hibs desperately seek the hat merchant.... she was no where to be found. Many said her name was Mahnala... so we waited at Ardee and Magmell for her to pop. "Maybe she is a day time pop." "Maybe she pops at 12". Still.... no Mahnala. Wait, THERE SHE IS! _The horse run just wasn't enough. We just had to invade, didn't we? Yes, we did. 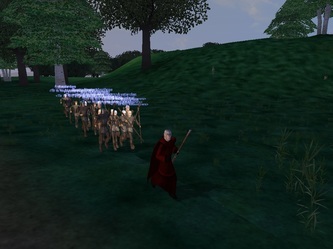 AA INVADES NIMUE! AA Placed players strategically from Howth to Ardagh - and we all purchased as many horses as we could! The horses rode for a very long time and created quite a crazy stream of horses!! 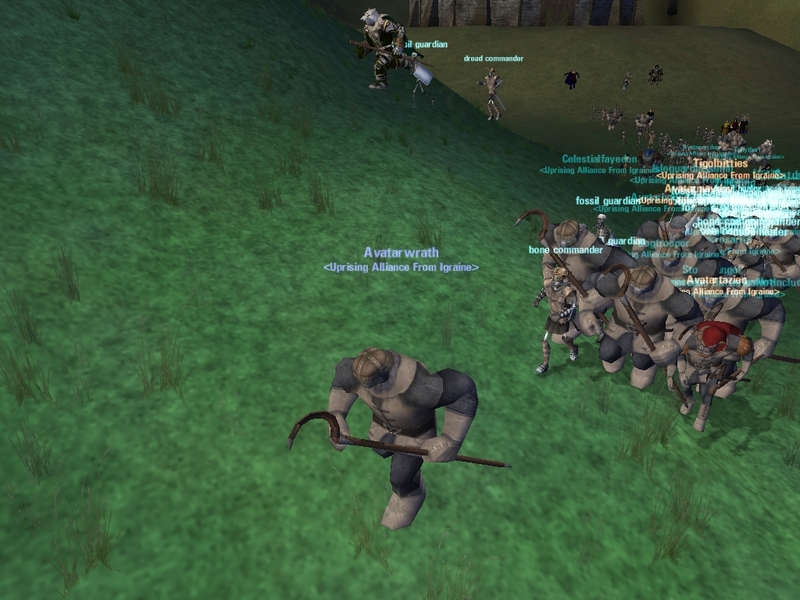 It was really funny until the server started lagging... so we stopped! Hah! 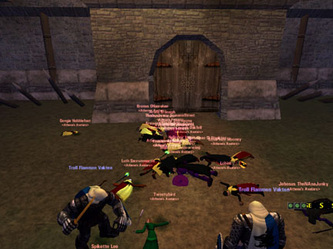 _We had a CF uber / Evern raid. Evern is a really tough lizard in the frontier near crim. He only took 30 minutes to kill, but we got him! After that, we headed to Marf to farm a bit until Jackmode killed us. GRATZ JACK! _We are on GUILD HIATUS! Happy holidays! We will have no planned events for quite some time. The holidays are here, so enjoy your families! _Guild event summary. Andred! 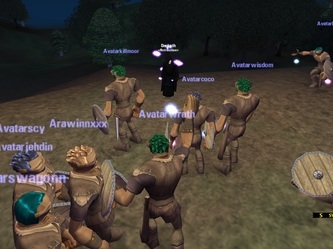 We all went over to Andred server and made level 1 trolls. We took our safety flags off.... and........ well you can imagine the rest. _Guild event summary. Seoltoir Impersonation! WOOOT! We all dressed up like our favorite Seoltoir and walked down with Glasny! It was a total riot! People were totally confused, asking why there were so many seoltoirs. After a few "pretend" ports, we decided to boycott Glasny and suicide. Imagine 15 dead seoltoirs on the port pad. LOL! _Guild event summary. Athena's Avatars invaded the frontier. This was basically a learning experience for the lower levels who haven't yet ventured out into the frontier. First, they were all shown Hib Frontier, and we ran into some Mids. Yes, they flattened our 4 fgs worth of avatars. LOL. Do understand that level 20's were permitted along this journey. After we returned, we were slayed once again. So, we took our party to Mid frontier, and we camped uppland for an hour. Guild event summary. 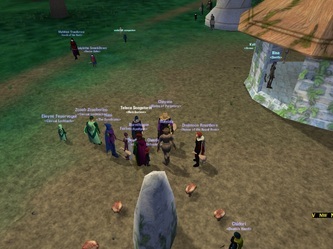 Athena's Avatars had a WONDERFUL guild event! 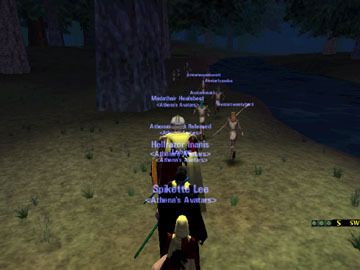 Each person was required to make a lvl 1 elf alt. We all went into the heart of the cursed forest. The first three to make it to the other side, would win first, second, and third place prizes. Wow! Surprisingly, about 7 avatars made it! It was a close race! Athena's Avatars has joined the new Hibernian Alliance! This alliance is RVR based, so lets use it wisely, and not to say hallo to Matador. Why would you speak to him anyway? He's a turd!!!! :p Hopefully this new alliance will become the new powerful rvr alliance for hibernia. Thank god. WOOT! Due to high demand, Hibernian News is going live. If you do not know what this is, it is a special news report brought to you by Athena's Avatars. If you haven't read it or heard of it, I suggest you take a peek. Thank you Lasa for you humorous reports! We all love them!!! _Greetings guildmembers, Here is a summary of yesterday's meeting. I've also posted this on our General Discussions Board for members. The first rank of officers was chosen by the guild leaders from the officers we already had in the guild. It was a hard decision, as many are quite capable of those positions, but we wanted a diversity of levels, among other things that were considered. Welcome to the rank 1 officers. Their duties are to help run the guild, especially when the guild leaders are not online. Settle disputes when possible and to watch over the Rank 2 and Rank 3 officers to be sure they are doing well. Rank 2, Council Members, were chosen from the remaining officers that were online quite a bit, were helpful to others and had been participating on the forums (shows interest in the welfare of the guild). This group, along with rank 1, will oversee guild matters and vote issues which are at the officer level in running the guild. Rank 2 will also be responsible for overseeing the Rank 3 officers. Congratulations on your new positions! Rank 3, High Avatar, consists of Hellforge, Braleth, Lymeh, Bequiled, Madathair, Cadrian, Corowin, Lavaonia, Misterhandy, and Johsiah (if I've forgotten anyone, please forgive me...there was a lot to keep track of). They are our eyes and ears in the guild. 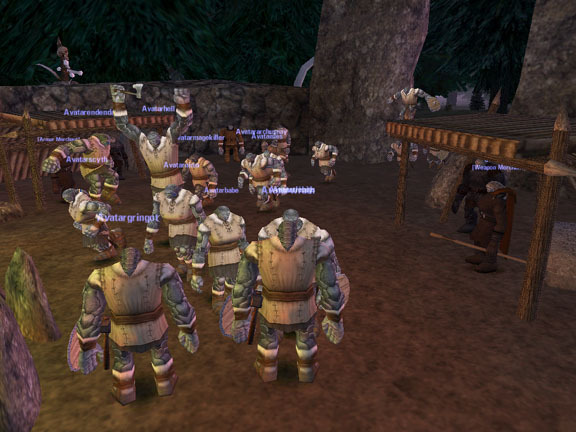 They can help hold armor and weapons to distribute, help others in the guild and give input on guild matters. They cannot vote on council matters, however, they can give their opinions and suggestions, which are valued by any member of the guild. NOTE: Officer Duties, Ranks, Rules, etc. are posted on the Guild Info Page as well. 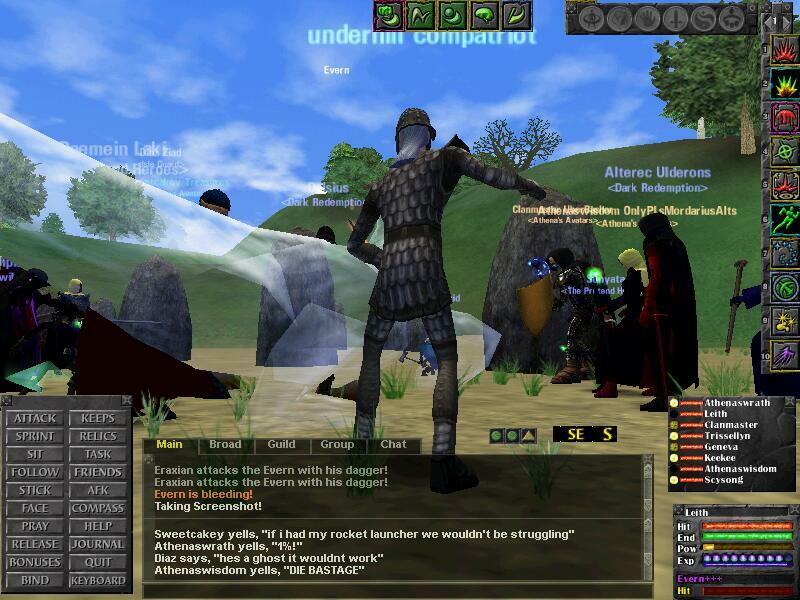 Also, Guild Commands, Guild Rules, Alliance Rules, etc. All members pleae read. 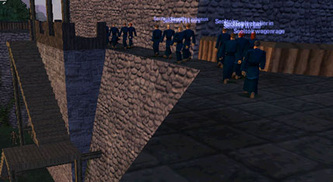 ALL OFFICERS must be polite, help others when you can (giving directions, helping to explain things, handing out equipment, helping with small amounts of money to new recruits - (suggested at 10gold and you will be reimbursed if needed - ask the new person if an officer has given them money..then check with that officer too), helping with epic quests, etc. This does NOT mean you spend your whole time online doing things for others...it means you help when you are able...and to make time a few times a week, if possible, to devote to helping other guild members. This also does NOT mean you need to be online every single day either. People have real lives to deal with, which is understandable. ALL OFFICERS must check when they log in to see who new recruits are and to introduce yourself as an officer and tell them if they need anything to let you know. It's a "meet and greet" so all members feel welcome and get to know who the officers are. The officer positions are earned....and can be lost (as in demotion). If you are not doing your duties as an officer, someone from the next rank down will replace you. When a Council Member (rank 1 or 2) becomes inactive, or misses too many meetings, he is replaced with a High Avatar from Rank 3. As we just restructed things, we may add to the upper ranks as needed. Right now, we have it set so there are 13 officers for voting purposes (uneven number...and lucky number 13). Basically 3 GL's, 3 High Council Members(rank 1) and 7 council members (rank 2) = 13. Promotions were given to several people (sorry, I can't remember them all)...but congrats to you all Just so people know...Rank 5 (Demi-God) is the highest Guild Member rank, before getting into officer levels. New Recruits - if you didn't make the meeting last night and are still listed as new recruit, please let an officer know so they can promote you to rank 8 Hero. This is only for people who were still new recruits as of Sunday Sept 1. FOR ALL MEMBERS: Please do NOT asked to be Power levelled! This has been a rule since day one in this guild. It puts pressure on the people you're asking. They feel obligated to drop what they are doing to run to help you. This isn't fair to them. Lots of times, someone won't say no because they feel guilty about not helping. They pay to play this game and have fun too. Being hounded is not fun. On the same note to ALL members: When someone logs in and asks for a group...there are usually some people on around the same level. It doesn't hurt to ask them to join you. Others have helped you by grouping...please extend the same courtesy to the next person down. This will also help stop the pleas for PL too. And we'll grow stronger as a guild..you learn people's fighting styles and how to work together, plus you make new friends. 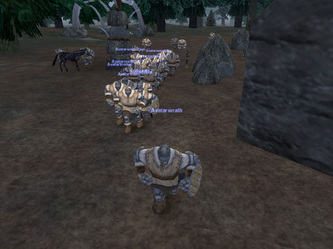 People that never get a response and can never find someone to group with, will eventually leave the guild, because they feel they are being ignored. That doesn NOT include pleas for PL though...we're talking about people looking for groups within their same levels. For any guild member - if you are happy with someone, please let an officer know...we like to show our appreciation to them By the same token...if someone is causing problems, let an officer know so one of us can discuss it with him/her. (Officer's - if you are really having problems with someone, then let a guild leader know please). Wrath has offered to give a platinum to all crafters who reach the 800 crafting mark. Also, please help out our crafters, so they can get their skills up in order to make armor/weapons/bows/arrows for our guild members (plus seige weapons for RvR). If you can spare a few gold now and then, please do so. and it looks like another guild will be joining our alliance soon. Negotiations are in progress. Congratulations to Miznatt (Gringot) on winning the new Color/Emblem contest. Looks snazzy. Another Update and Some Fun to Watch! Please be sure to visit http://www.twistingheavens.com/th/daoc/ AND MAKE AN EMBLEM. Just tell me the primary and secondary colors, and emblem if you change that. I will be posting the ones that people have made HERE, so be sure to click here to view other emblems guildies have made!! Also, one final week to get those poems in! Contest ends SUNDAY. Click here to see what poems has been submitted!!! Do not forget to write your SLOGANS as well! A new catchy phrase will title the webpage! Please submit those and view those submitted. AVATARS! If you want an email from this domain, PLEASE GET ONE. Email WRATH. 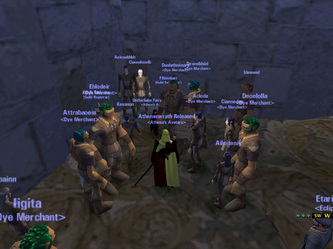 _Today at the guild meeting several things were decided. We will soon be voting on a NEW emblem design. More details coming on that. ALSO: Avatar Slogan/Poem Contest. Winner will receive 200GP! Every entry will be awarded 10GP, so GET THOSE ENTRIES IN! It doesn't have to rhyme, but it needs to be 10 lines or under unless you get fancy and do a sonnet. It needs to involve the guild and hibernia. Those are the ONLY requirements. It can be humorous, witty, serious, or all of the above. Guild officers will call a meeting and review the poems and declare a winner. Winner will be announce TWO weeks from August 4th. GOOD LUCK ALL! Please submit poems to AthenasWrath@AthenasAvatars.com. FURTHERMORE: Monday has officially been declared as ALT day! 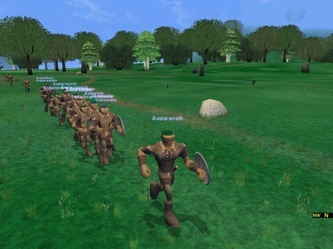 We all log on our alts and play them on Monday instead of our high lvl chars. This way we all get to group with each other and die together. This is being incorporated with Monday night Lowbie Love. Woot! _New Screenshots were added! Be sure to check that out! 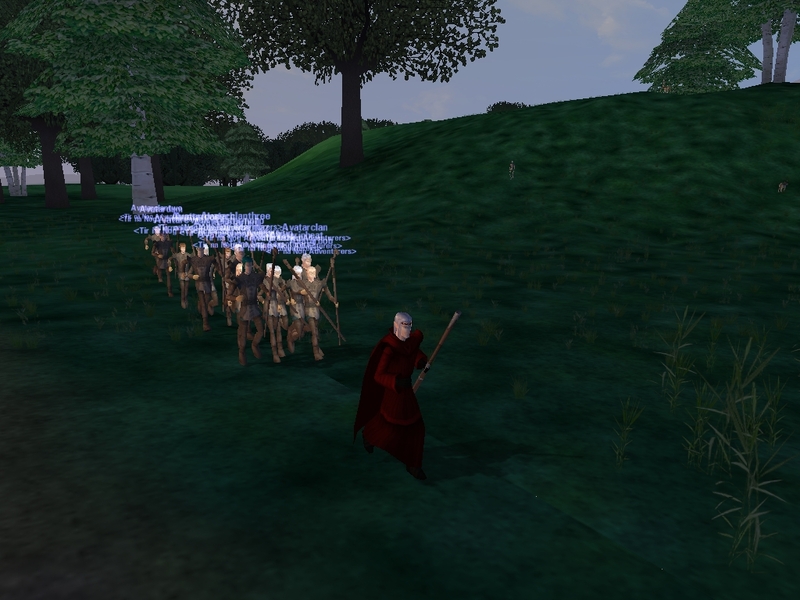 _Athena's Avatars allied with Legacy of War and Lords of the Hunt! Congratz to all! _Once again, congratulations to all who have been promoted! Two new officers were created, Nima, and Tamako! Congratulations to both of you! Guild invite abilities has been restricted to rank 6 and up. For guild hierarchy information, please see the guild hierarchy list (link removed). 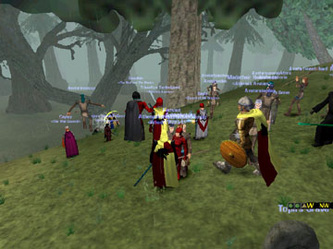 _Athena's Avatars allied with Celtic Vengance! Congratulations to both Guilds! _Guild meeting this Sunday (July 13th)! Everyone that is a NEW recruit needs to attend. Promotions are ONLY given at guild meetings. Please attend if you wish to be promoted! The same rule applies for members. If you are to be promoted, it will only be at guild meetings! 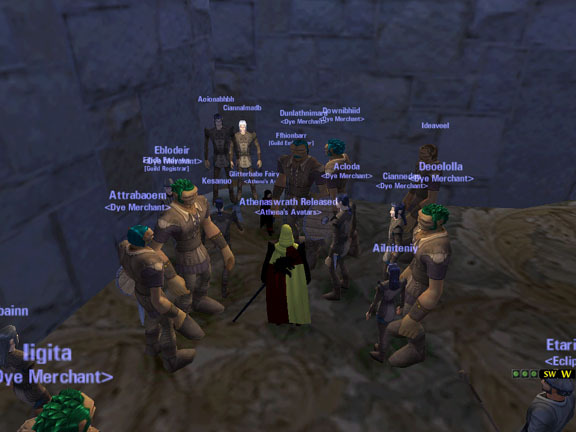 This guild meeting is primarily for the purpose of new recruits becoming full fledged members! Members are not required to attend, but invited. 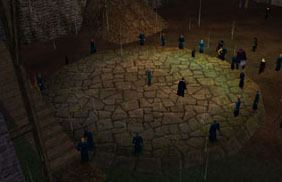 The big guild meeting will be held the following Sunday, July 20th. _Greetings to the Athena's Avatars! 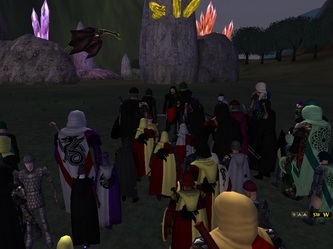 Last night the guild had their first guild meeting in front of Mag Mell. Thank you to all that came. 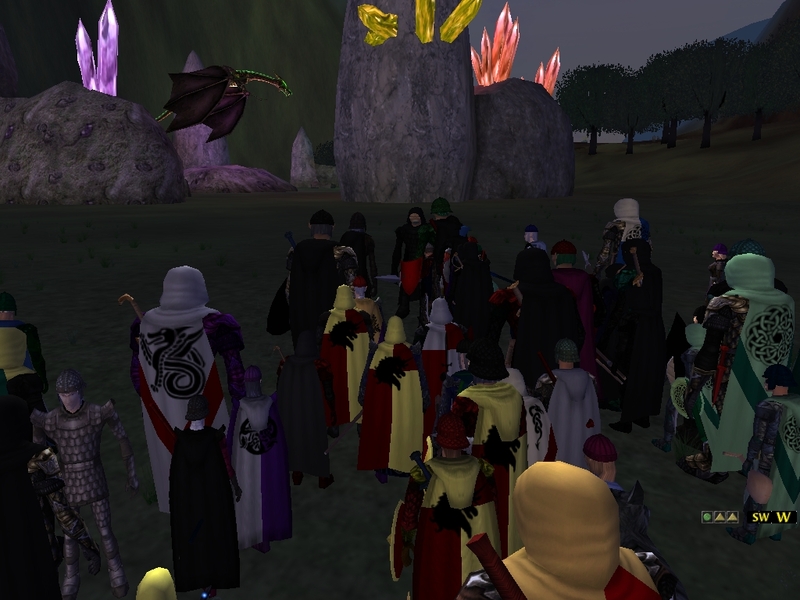 Goodies were handed out and guild guidelines and suggestions were taken. It's been decided that a guild meeting will be held every 2nd Sunday at 7 p.m. CT (9 p.m. EST), followed by an XP evening for higher levels (level 30+). 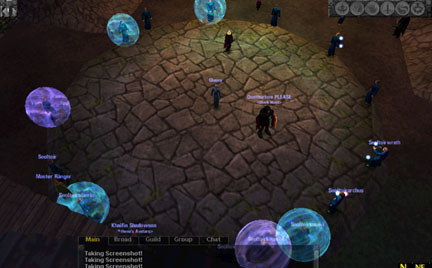 XP night for high levels will be EVERY SUNDAY....guild meetings every second Sunday. On Mondays, we'll be having a Lowbie Love night where the higher level players will be helping out the people below level 30 to gain xp. We'll also be starting to schedule raids as we climb higher in levels and in numbers, so anyone with good crafting skills will be needed to make proper siege equipment for beating down keep doors, etc. 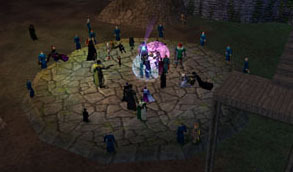 It was suggested that Wednesday nights be Guild Game Night where we schedule races, scavenger hunts, etc. 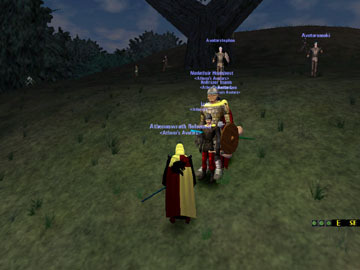 Another good idea would also to have a Quest Night...where we help others out in completing their Epic Quests. Also, for the next 2 weeks, ALL FULL MEMBERS have inviting privlages to invite others into the guild. We're looking for members that are pleasant, enjoy groups, will share their finds if they can't use them, etc. Basically, no jerks please.